Anwar al-Awlaki, a Yemeni-American Muslim lecturer and preacher, called on American Muslims to turn against their government because of its actions against Muslims around the world. 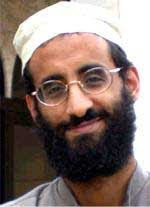 Believed to be a senior talent recruiter and motivator for al-Qaeda and described as “the bin Laden of the Internet,” Anwar al-Awlaki described his own radicalization after U.S. operations against Muslims in his latest message, aired on CNN yesterday. It was thought that he might have been killed in a pre-dawn air strike by Yemeni Air Force fighter jets on a meeting of senior al-Qaeda leaders at a hideout in Rafd, a remote mountain valley in eastern Shabwa, on December 24, 2009, but this was clearly a forlorn hope: he is as alive as he can communicate his peaceful thought—please don’t forget that Islam is “the Religion of Peace”—by addressing the American Muslims on Cnn. And men have lost their reason." ..It isn't the first time and unfortunately it won't be the last..
From what I've read, al-Awalki influenced Nidal Hasan, the Fort Hood murderer, and may have recruited the doofus underwear bomber. And he's a U.S. citizen. The best solution would be to kill him, but if he's captured, he's one of the few who really justifies a charge of treason and the death penalty that goes with it.